This study was begun on Sunday, May 27, 2018. 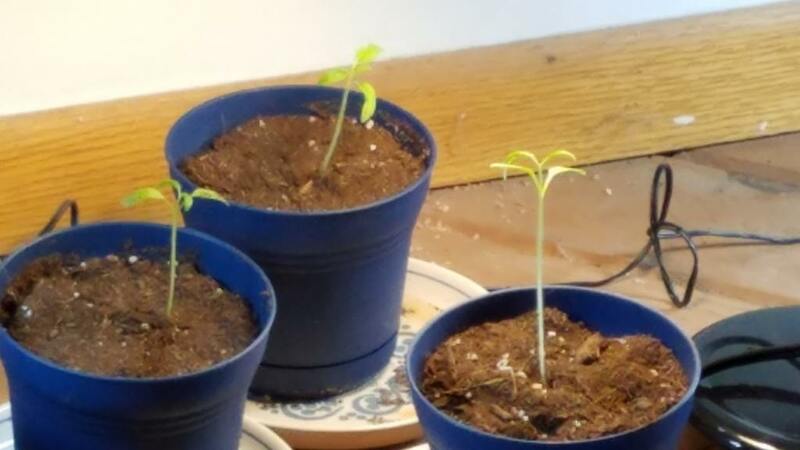 We have three sets of tomato seeds, all planted on the same date. Group 1: watered with well water that went through a water softener. Group 2: watered with well water that went through a water softener, then structured using a portable water structuring device. Group 3: watered with well water that went through a water softener, then structured using a portable water structuring device. 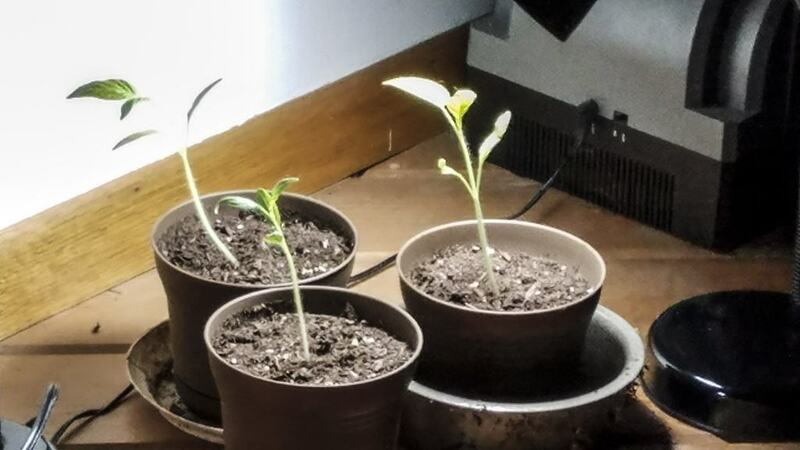 Once sprouted, light has been added. We wanted group 1 and group 2 to have the same exact lighting, but we did not have two bulbs that were the same, so we gave Group 1 the whiter of the two bulbs. Group 3 got a Pure-Light bulb. We are posting photos of the results as they come in. As you can see, nothing so far three days later. 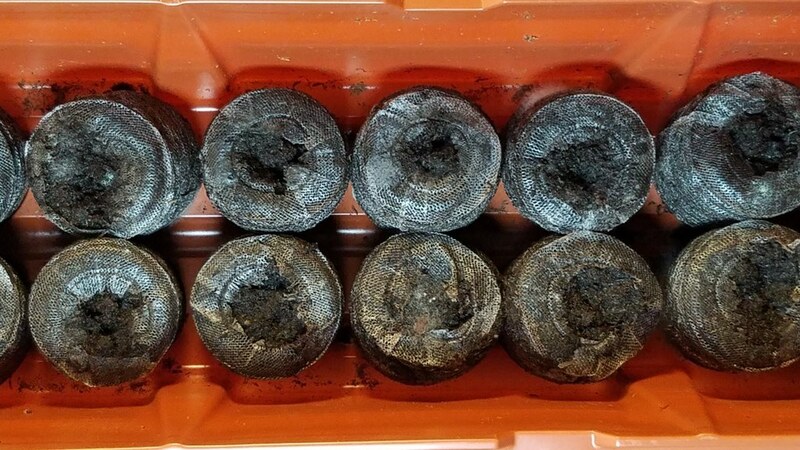 And in this last photo, you can see mold on the two far right pods, bottom row, and a bit on the far right one on the top row. 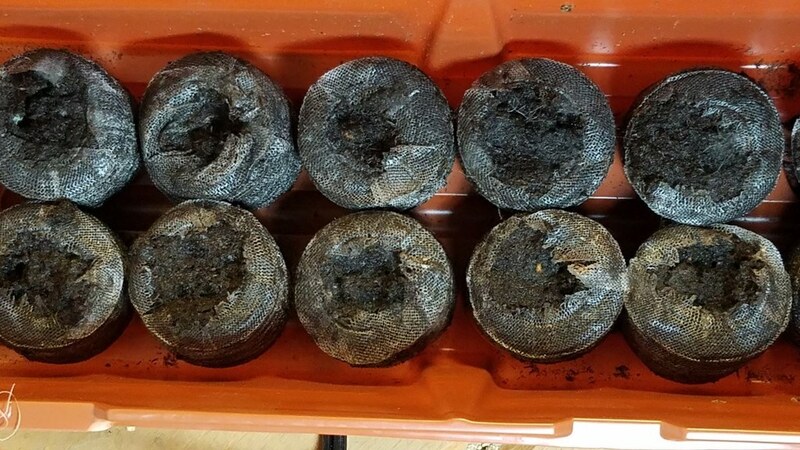 You can see that this experimental group, watered with Structured Water, has already started sprouting (75%). 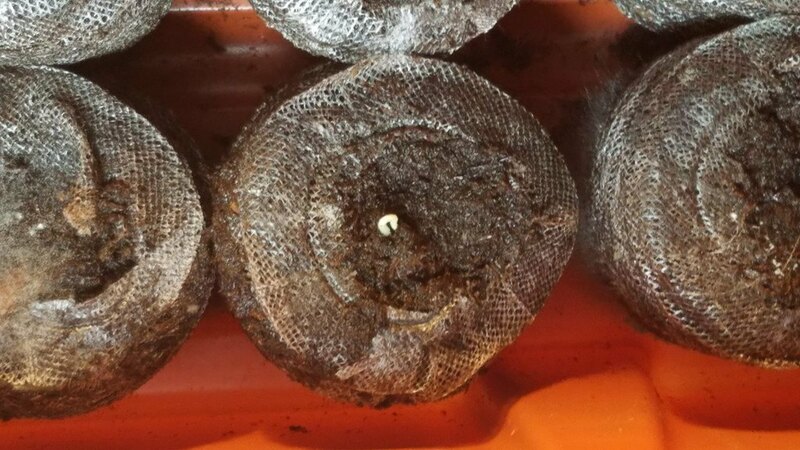 On the morning of the fifth day, we have about 30% of the control group sprouting. At the end of the day, you can see that in the control group, about half have sprouted. Tomorrow we will have to put the light on them. Remember, the light is a bit whiter than the light the first experimental group (right next to this group) is getting. 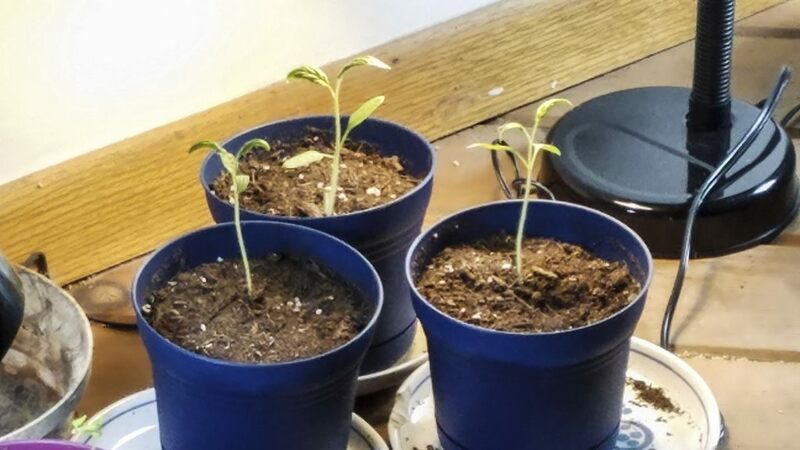 On the fifth day, the experimental group is flourishing (below). And it’s a good time to see the comparison. 75% of the pods have seeds sprouting in the Experimental Group 1. The difference in color (in the photo) shows that we’ve put a “whiter” like on the control group. 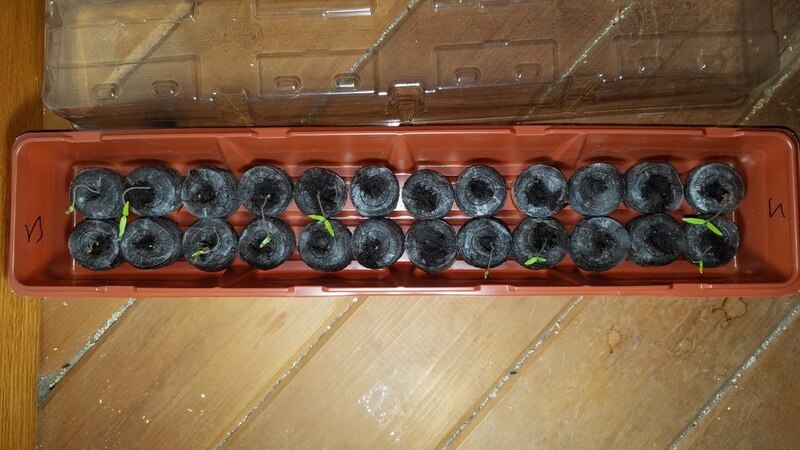 This should actually make them grow faster, but as you can see, they’ve not sprouted well; right around 50%. 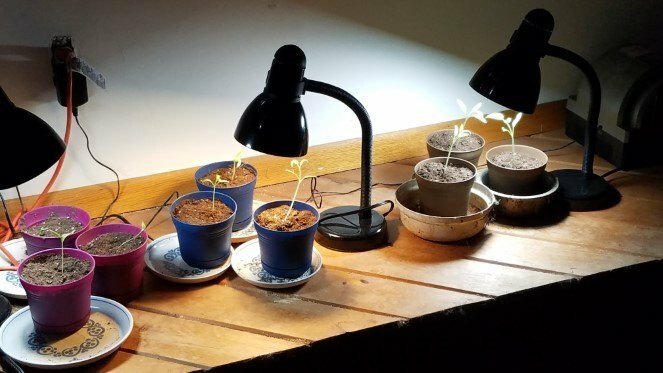 At this time I should bring in the second experimental group (Experimental Group 2); the group getting not only Structured Water but the Pure-Light bulbs. 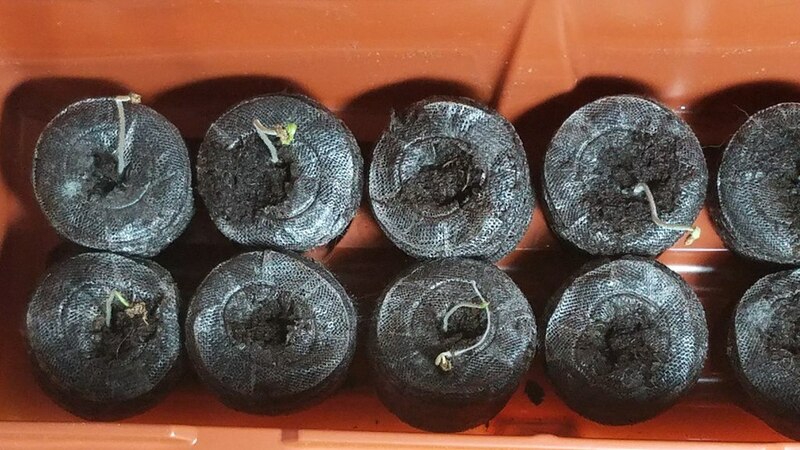 As you can see, we’ve got at least 75% sprouting, some just getting started today, and they’re not flourishing like the first experimental group. Even though they are doing better than the control group, you always have to take into consideration one specific variable. This is something you can call, “user error,” or as we called it in my computer days, a “One D Ten T” error. Yes, folks, the idiot performing the study is just another variable. 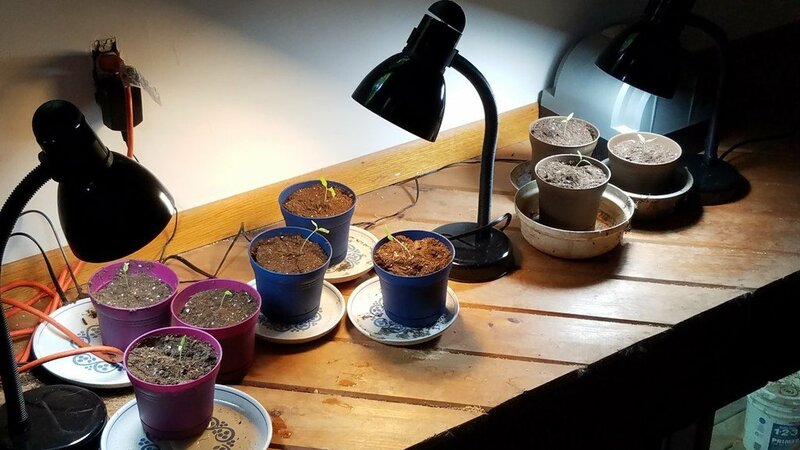 You should know that the first two sets of seeds, the control and experimental group 1, were planted/completed first, after which the animals had to be fed, and the staff (me) had to be fed, then a quick look at the nightly news, and then finally back to the project. Being a bit tired, I might have screwed up. I could have planted the seeds deeper than the others, or didn’t scrape enough of the growing material over the top. 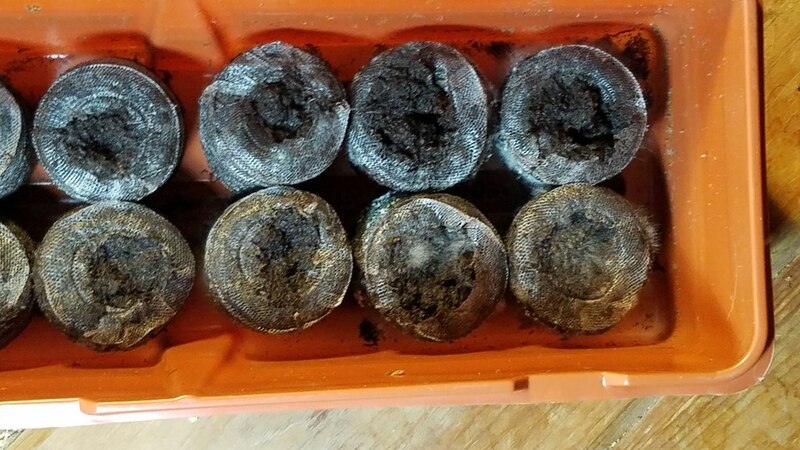 We do know that the pods are checked daily for moisture, and if drying out, we add water; regular water to the control group and Structured Water to the rest. Now you know about another variable in studies: the people performing the study. As we continue forward, the control group has a little whiter bulb than the first experimental group. 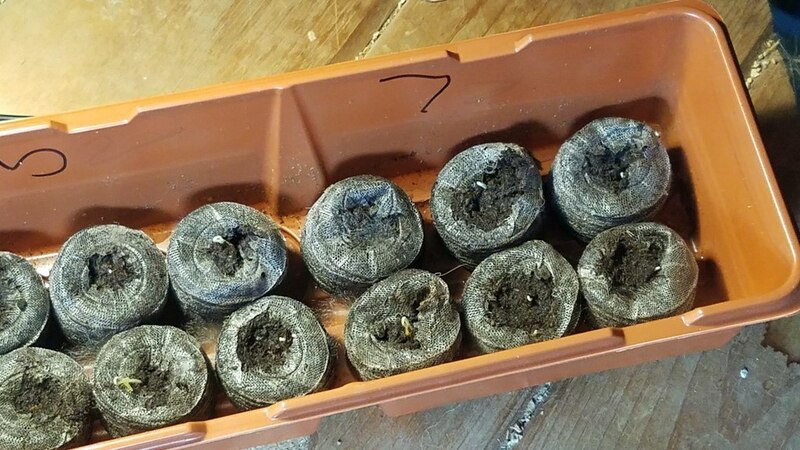 That will help with growing, but not sprouting. We’ll also be comparing the two experimental groups. 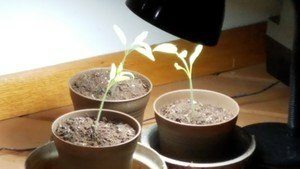 The lighting used really doesn’t come into play until leaves are formed, which is where photosynthesis takes place. 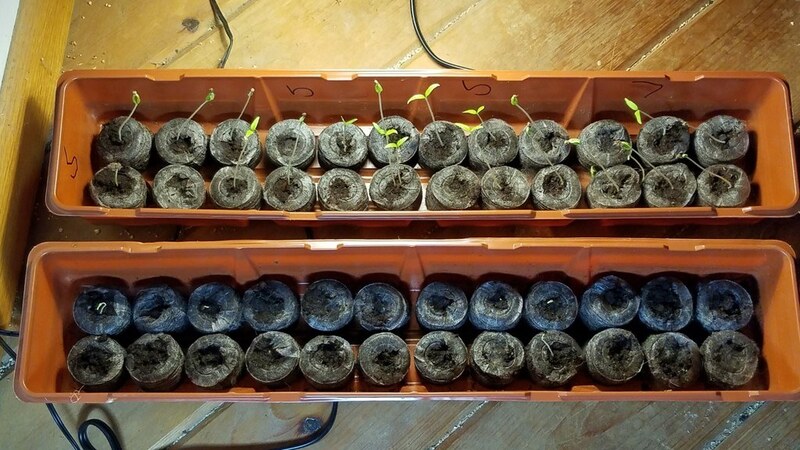 The seedlings have all been transplanted. But get this: I have really cared for the “control group.” You see, I’m one of those who always cheers on the underdog. 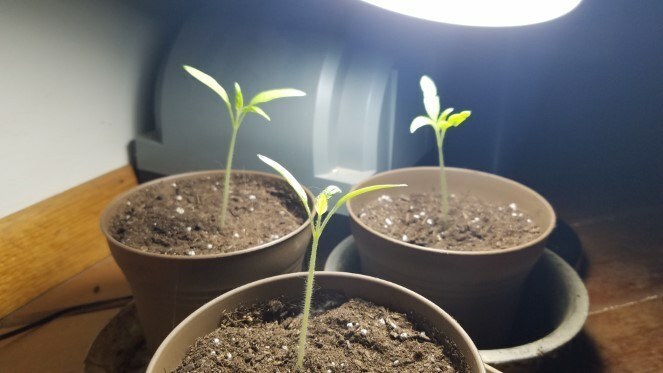 I transplanted them first and was very careful. Every study is affected by the people doing the study, and this one’s not any different. 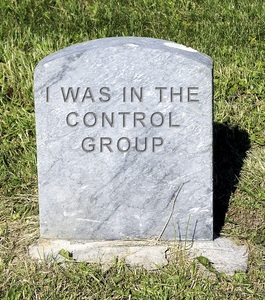 I’m hoping for the control group, and taking care of it better than the others. Sorry, I’m just that kind of guy. But wouldn’t you know it; my special care hasn’t helped. 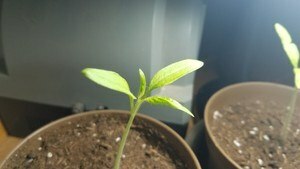 One of the control group seedlings dropped dead overnight. Here they are on my “cat walk,” which is a ledge overlooking my great room. Normally only the cat goes out there, but I figured it was the perfect place for the study because it was out of the way. You can see that the leaves are a bit thicker, healthier. And in the next picture you can see that the stems are even thicker and healthier. 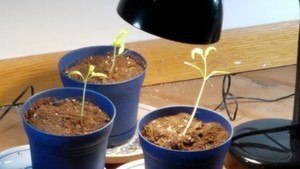 These final shots are of the plants with both Structured Water and Pure-Light lighting. These are just slightly thicker and healthier than the first experimental group. And you can’t really make it out, but in this group, each plant is leaning toward the light, more-so than in the other two groups. Now, to get really accurate, you have to measure the widths of the leaves (and stalk) which I did, but there are no pictures to prove it. On the left is the first experimental, just Structured Water, on the right is the water plus the special light. 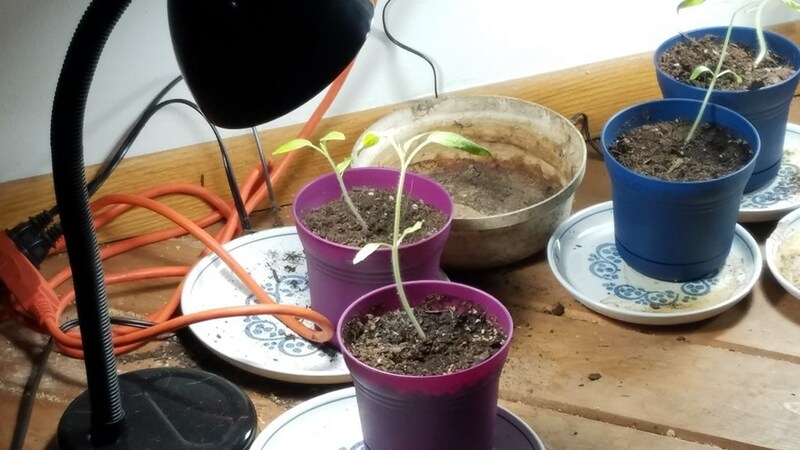 I did measure them both, and the ones on the right are slightly bigger (wider leaves) with thicker stems. You won’t get a photo of the measurements because it is really impossible for me to measure, shoot the photo, and hang onto the wall so that I don’t crash into my living room thus ending both the experiment and my life. The differences are very slight, and we’ll see over the next few days what happens. Now some will say, but the light on the group on the left is further from the plants. Actually, because the handle on the window (that I cling to so I won’t kill myself) is RIGHT above the light. 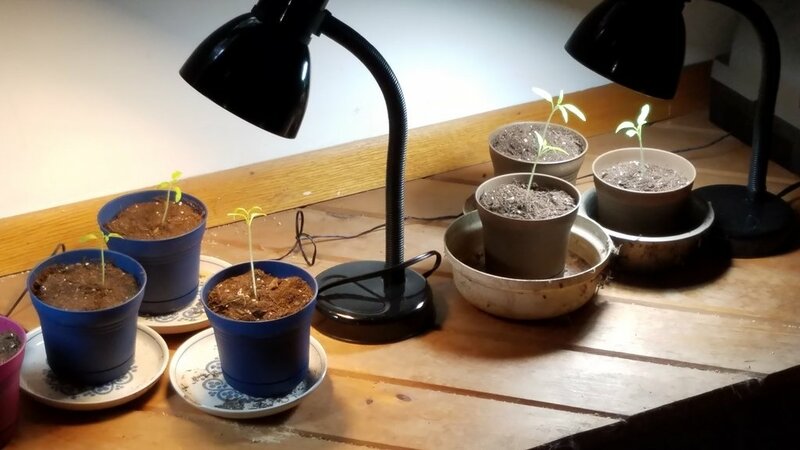 To measure the plants today, I had to move the light just a hair. 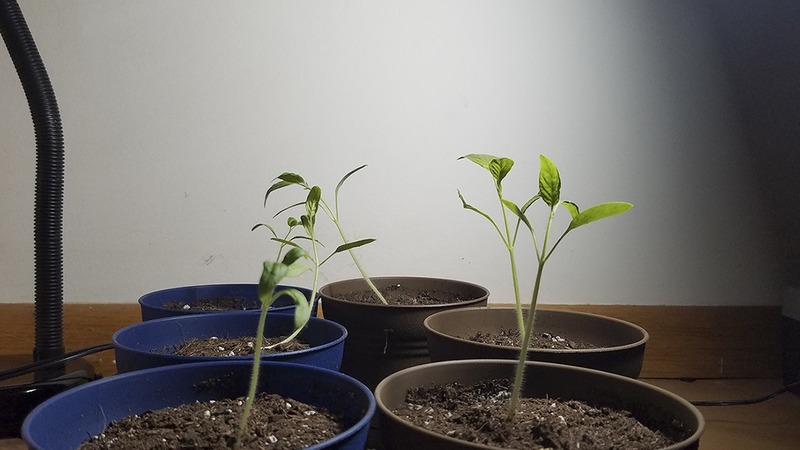 You can still see a quantitative difference between these two groups, and now you can see the plants on the far right leaning toward the light. Experimental Group 2. You should be able to spot a difference. We can really see a difference today. You can see that the Structured Water groups (middle and right) are way out in front of the control group (purple on the left). 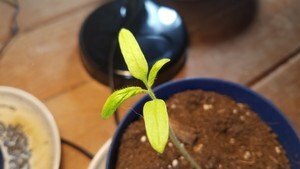 In fact, another seedling in the control group has fallen down. Here are the two Structured Water plants side by side with the Pure-Light group on the right. As you can see, the light is helping quite a bit. It might be time for a crossover, which I will explain shortly. I should tell you I’ve brought in a fan for the plants. They’re all getting a bit of wind to help them grow sturdier stalks. What a difference a day makes. Because the camera really cannot capture what the human eye can, I invited my computer guru to take a look. We both agreed that the Pure-Light experimental plants were twice the size of the Structured Water only experimental plants. I’m going to show you more pictures anyway. Hopefully, you will see this too. 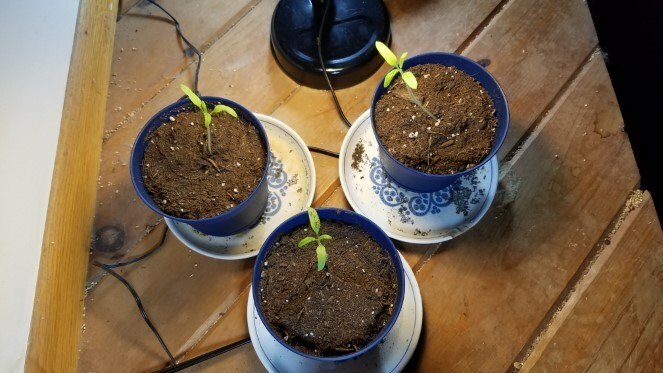 Though I should tell you the the best way to do this test would be to have a whole green house full of these three different groups, pick three plants from each group daily (right at the point the stem touches the “dirt”), and weigh them for a comparison. I just don’t have room for that. And here they are one at a time; first the Structured Water Only group (Experimental Group 1). Hopefully you can see the difference, because this leg of the experiment is completed. We have proved that the Structured Water seedlings grow faster and better than seedlings that got regular well water (softened) only. And we’ve proved that there is more mass to the plants that got the Pure-Light lighting. So now we are going to do a crossover. Just a semi-crossover, actually, and I really need to explain what a crossover is. First, we have to realize that this is a double experiment. There are two control groups and two experimental groups but three groups. First we have the control group that is getting regular water. Then we have an experimental group getting Structured Water, which is a control group for the second experiment concerning the lighting. And finally we have an experimental group that is getting Structured Water and Pure-Light lighting. 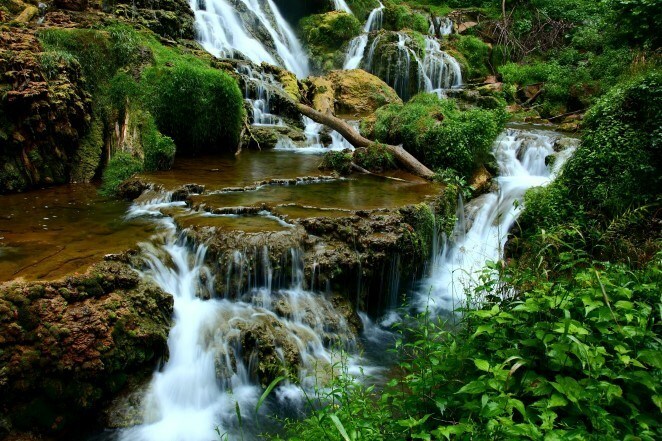 We quickly determined that the Structured Water groups grew faster, better, and stronger than the control group, and now we’ve also determined that the Pure-Light group has grown faster and larger than the Structured Water only (control group). Now you know why we consider this sort of experiment unethical, it tends to kill off the control group. Using control groups that have life threatening illnesses is unethical, especially since over the years we have collected enough data from cancer studies to create a “virtual” control group in which people are not used, just statistics. In this ethical study, the experimental group’s outcomes are compared to the virtual group’s virtual outcomes. But in the old days (they still exist in various parts of the world), after a drug has proved some degree of effectiveness, the control group is then given the experimental drug. When you do something for or to the control group that you were previously doing for or to the experimental group, you have just created a crossover. The control group crosses over to get what the experimental group was getting. So, today I will switch out the bulbs and give everyone the Pure-Light lighting. 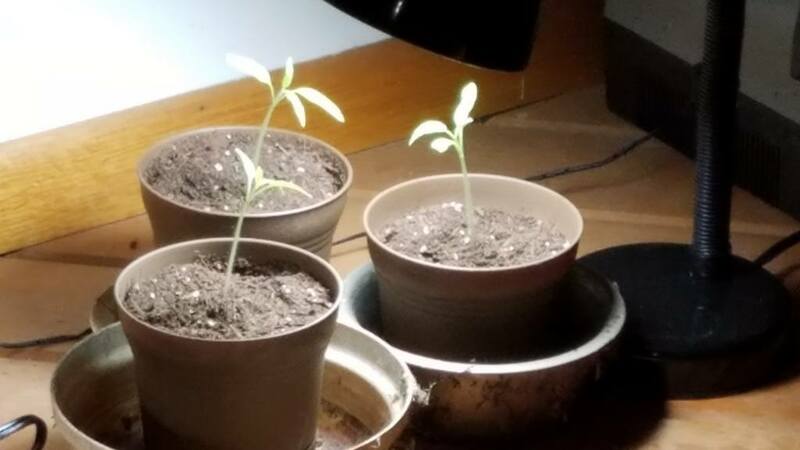 I’m also going to have to get some bricks to raise up the lights so we can distance the light from the plants since the plants are growing right into the lights. We still have one group, the regular water group, that will still be a control group, though it will also get the new lighting. We’ll see if that poor group can overcome their handicap using just new lighting. Oh, and someone just reminded me that I’m an idiot (again). Simply the Best (a non profit store on the web that gives all its profits to charity) has these Structured Water Devices on sale at 25% off. People who’ve said in the past they can’t afford them are now saying they can’t afford not to get them at these discounted prices. Take a look! And the Pure-Light Technology bulbs can be purchased there too: Pure-Light Technology. 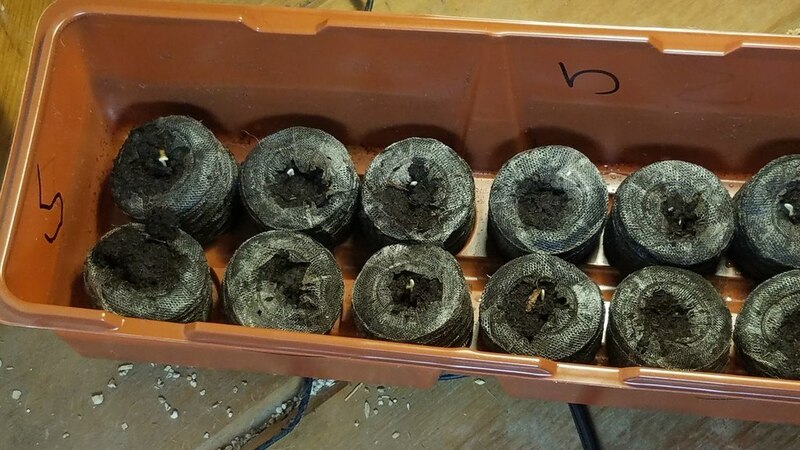 They’re not just great for growing plants, they also purify your air and kill fungus and mold. 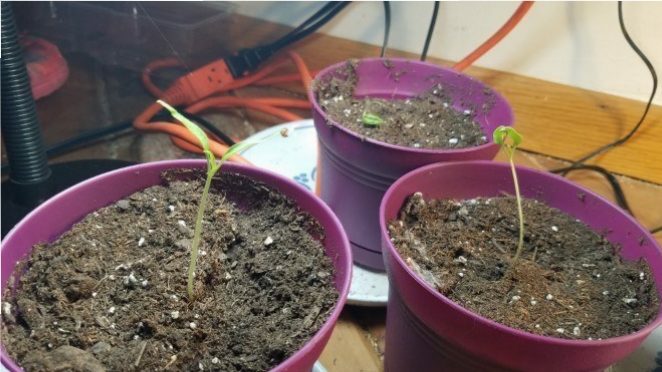 We have demonstrated that seedlings sprout faster and are larger using Structured Water, and that the addition of the Pure-Light Technologies lighting really boosted growth. That’s as far as I’m taking this. 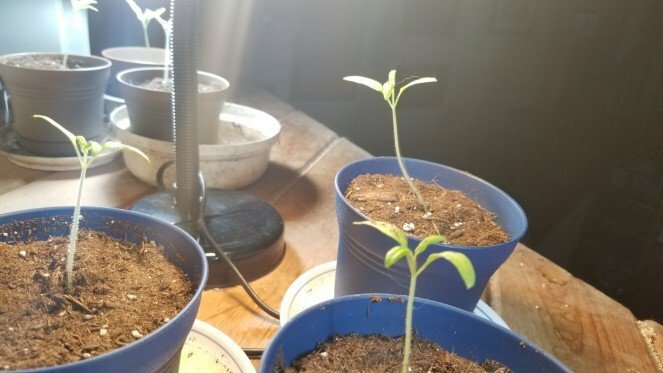 I could transplant the tomato plants and continue using Structured Water on the experimental group and regular water on the control, but I am 1. a horrible farmer and 2. busy as hell. We have demonstrated enough and I have to get on with building this site, shipping for Simply the Best and writing a few books (as well as healing the horrible winter I’ve had). But I am going to post one more photo. 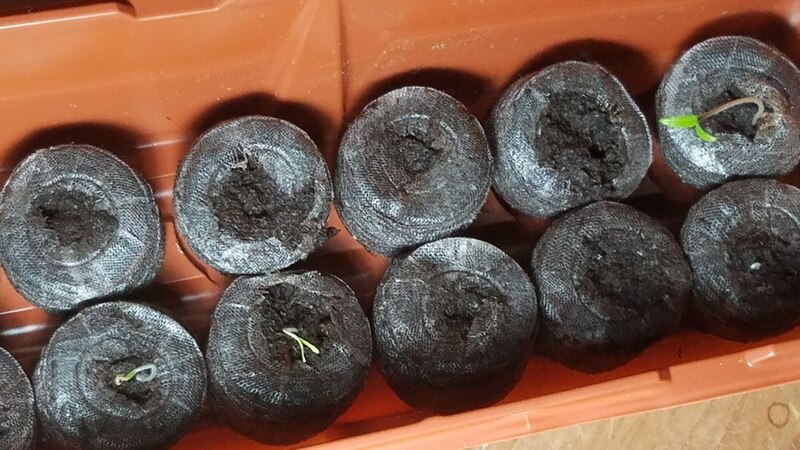 I’ve transplanted four of the seedlings from the experimental groups and will continue to water them with Structured Water, but they are in huge planters that I’m putting at the end of our driveway because there’s hardly any sunlight in the woods here. Previous Post Smoothie Secrets Next Post A Cure for Type Two Diabetes — Accidentally discovered!